This set of small batch hot sauces is made with rare, varietal peppers. Handmade in Portland, Oregon, this set of hot sauces gets its custom kick from all organic ingredients. Shaun Winter sources heirloom peppers and garlic directly from small-scale growers in the region, using rare, varietal chiles that you won't find in the supermarket. He ferments each small batch to produce thick sauces with unique flavor profiles, featuring four levels of heat: poblano (mild), Hinkelhatz (medium), original (medium-hot), and Orleans (hot). 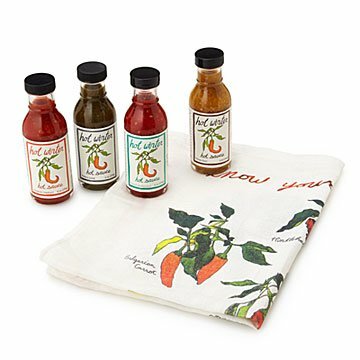 Each fiery collection comes with a "know your peppers" screen printed tea towel. Shaun Winter developed his own variety of chili pepper while working on a farm in Northern California. He now works with regional growers to produce peppers and heirloom chilies and garlic. He combines these flavors and aroma to create superlative sauces. My husband loves hit sauce & can't wait to try all of them!!! Shaun makes the best hot sauce. There are a wide variety of heat levels but what sets this hot sauce apart from the rest is the outstanding flavor. I have been buying nothing but Hot Winter hot sauce for the past 2+ years and buy it by the case. It is great on everything. I use spices on just about all foods. in eggs, on meats etc. Great flavors, could have been a little more kicked up for me.